Wirtschaftsagentur Wien will be acting on behalf of Vienna City and other partners at the exhibition and will be bringing two companies from Vienna as testimonial. For over 30 years, the Vienna Business Agency has been actively supporting the development of Vienna as a business location. As the first point of contact for national and international companies, the Vienna Business Agency offers advice, real estate, and financial funding. The goal is to strengthen innovative companies in Vienna along with their innovative capacity. Vienna Business Agency is currently part of the IC3 project. Are you interested in Viennese companies and AAL projects? Visit their stand! 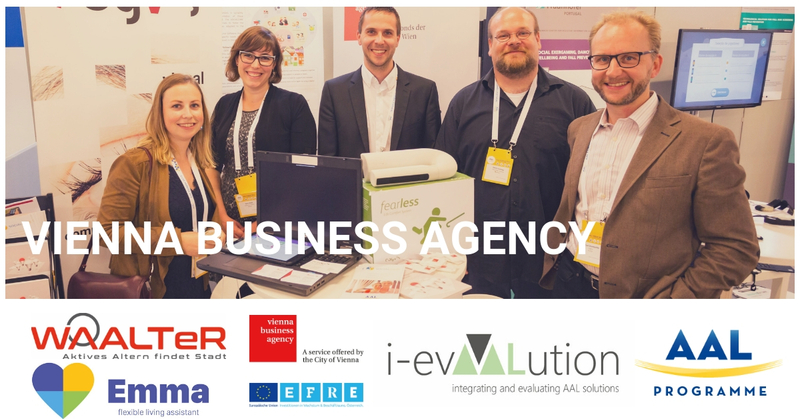 The two represented companies are: Johanniter Ausbildung und Forschung who participate in several AAL projects, will be exhibiting these collaborations: My-AHA, i-evAALuation, WAALTer, and Exthex who will be showing their latest project EMMA. EMMA is a flexible living assistant and a one-stop-shop for people growing older and their relatives. EMMA consists of EmmaHome, a voice-controlled assistant and EmmaHelp which supports relatives with information about caring at home. Together EMMA increases the safety and quality of life for the whole family.